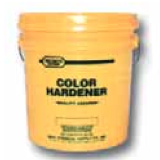 Looking to buy Increte Color Hardener in Rochester NY, Ithaca NY and Western New York? With an A+ reputation for customer service and prompt pick-up and delivery, the Duke Company proudly carries the full line of Increte Stamped Concrete System products. Increte’s industry leading color hardener is renown for being immediately ready for use as a dry shake powder. The powder is very effective in coloring and hardening freshly poured concrete and creating professional-grade decorative concrete surfaces. Increte’s Color Hardener has the additional benefit of dramatically increasing the strength of the surface to over 8000 pounds per square inch. The product is highly recommended for high traffic and medium traffic surfaces such as shipping centers, schools and sidewalks, and is designed to be used indoors and outdoors. Available in convenient and portable 60 pound pails.